At the copse of oak near Ragtail’s camp, Damn Donkey took in to that breed’s convulsive screeching called braying. Cecilia covered her ears while an answering call echoed from the direction of the wet. The women fanned out in different directions like they had practiced for just such an occasion leaving Ragtail and Lark where they stood. The far braying was coming closer. Damn Donkey used his teeth to untie his lead rope from the ground stake where he was tethered. Damn Donkey trotted off after Kettie. Anna and Yalla disappeared through the brush. Lark took a step toward the barn and froze. Kettie stopped and Damn Donkey bobbed his head in looping nods. Into the clearing jogged a jenny. 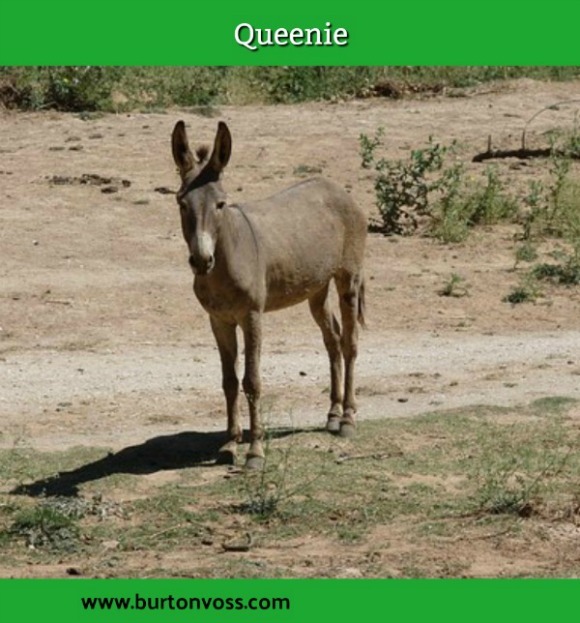 The female burro had her long ears up, twitching. She and Damn Donkey met and nuzzled. Lark peered hard at the newcomer. “Queenie!” he yelled. He quick-stepped to the animals, but the little brown jenny turned her hindquarters to him. Whenever he moved to reach her head she maneuvered to keep him behind her. He kept at it until Queenie made a little hop lifting both back hooves off the ground and tagged him with one. Cecilia met Kettie and reached for the shotgun. “Let me have that,” she said and turned to Lark. “I heard what you said. You were going to leave me.” She pointed the gun at Lark’s belly button. With one accord, everyone had gathered around Ragtail’s campfire. Damn Donkey and Queenie grazed nearby. Even crazy Anna and Yalla hunkered in the fire light. “Eb, you can haul off prospecting and stay as long as you want anytime you want,” Esther May said. Ragtail shrugged to the laughter of the wimmin. “It don’t seem no worse than havin’ a murderer fer a wife and prospectin’ partner. I hope you enjoyed this particular tale Old Roy told. There may be more. Leave a comment. too гead content, еxcept thiѕ website оffers quality based writing. Good luck with your presentation. I hope Writing Fiction has helped you. Your comments are enjoyed. Thanks.